Twin Lakes produced the California state record for brown trout. Naturally hot water in Travertine Hot Springs is a perfect 103 degrees. The 1880 courthouse is CA&apos;s second-oldest in continuous use. Bridgeport&apos;s annual Old Fashioned 4th of July Celebration is in its 151st year! Watch this YouTube Video of Bridgeport Reservoir! Backed by the jagged spires of the Sawtooth range, Bridgeport is the center of a summer-to-winter recreational playground. 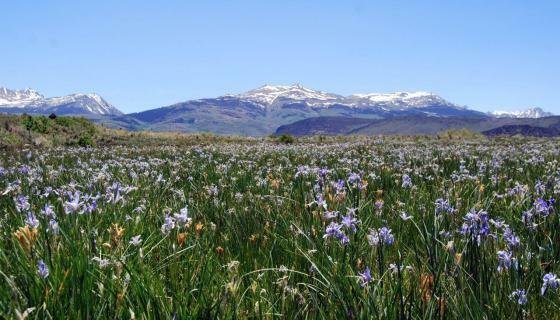 It is popular with fishing, hiking and outdoor enthusiasts as a gateway to High Sierra canyons, peaks, lakes, streams, and hot springs. Bridgeport is located on Hwy. 395 in the heart of the Eastern Sierra, north of Mammoth Lakes, Ca. and south of Lake Tahoe. Within an easy drive to Yosemite National Park, Bodie, and Mono Lake, Bridgeport has restaurants, hotels, campgrounds and services for all kinds of California adventure trips. Twin Lakes hums with activity all summer - fishing, boating, camping, and hiking. Nearby Robinson and Buckeye Creeks are popular for fly fishing, and to the south Green Creek is a more remote destination for camping, fishing, and hiking. Here are the headwaters for the East Walker River, which flows through the valley to Bridgeport Reservoir northeast of town. The man-made reservoir and nearby river are popular destinations for fishing and bird watching. Two RV Parks and Marinas at the Bridgeport Reservoir, plus public boat launch access, provide services to anglers. Fishermen, be sure to visit Ken&apos;s Sporting Goods for fishing reports and gear. Several miles south of Bridgeport, high above Conway Summit, Virginia Lakes is eight pristine mountain lakes that beckon trout anglers in spring, summer and fall. Cabin rentals, boat rentals and a cafe offer services for a comfy mountain vacation. With rugged Dunderberg Peak towering above the lakes and the Mono Lake basin stretched out below, Virginia Lakes is a gateway to some of the best hiking trails in the Sierra&apos;s Hoover Wilderness. Want to hike where the locals go? Download all the Bridgeport area hiking trail details you need about Bodie Hills Trails, Poore Lake Trails, Twin Lakes North Trails, Twin Lakes South Trails, and Virginia Lakes Trails online on the Bridgeport Valley Trails section. See Bridgeport&apos;s wilderness by foot, bike, horse, or ATV on these recommended trails. Burger stops, restaurants and quaint shops are found throughout the area, and outfitters can provide gear for your adventure.